Join us at our place for some great times with REAL party animals! Please Note: During the check out process you will be asked for a start time and you may be asked for an end time. Please select 30 minutes after your start time for your end time. Your party may last as long as you like (until we close for the day). "End time" just lets our system know your check-in time window. Also, please be sure to use our Jubilee Zoo address for party location address so you won't be billed a travel fee by our system. Extra guests (paid with your party ticket) discounted admission price of $10. Note: The Basic Party Package is only available on Saturdays and Sundays during regularly scheduled open hours. Color-Me Jubilee shirt NOT included with this package. Package Price - $120.00 To book any party click here. Package Price - $255 To book any party click here. One pony ride for each child under 90 lbs. Package Price- $255.00 To book any party click here. Discounted admission price of $10 per extra guest. One pony ride for each guest under 90 lbs. Package Price- $395.00 To book any party click here. .
We offer several party packages to accommodate various needs and budgets with discounted pricing on packaged activities. If none of our discount packages suit, you are still invited to party with us. Just come as you like during regular hours and pay standard admission prices. You are welcome to bring cake/food and purchase your party décor and party favors from Jubilee Gifts or bring your own. Please call us and we can help you plan so your event will be the Party to Remember! If you would like to open a tab with us so you may pay at the conclusion of your party, you MUST CALL AHEAD. Though there is no requirement to prearrange your impromptu party with us if you pay as you go, we recommend that you call ahead anyway so we will be prepared to best meet your needs. 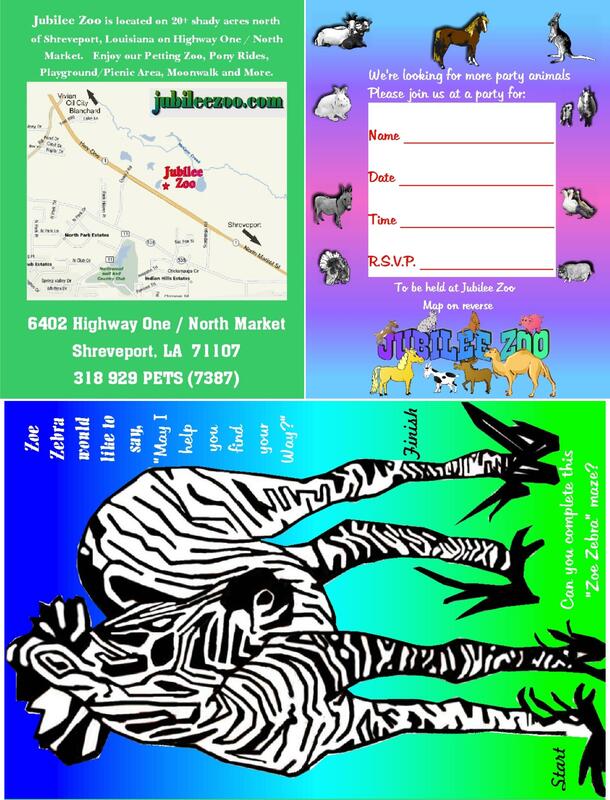 For Events at Jubilee Zoo booking assistance please call us at 318-929-7387 or mobile 318-519-7813. Want a private party? Rent the whole park and any or all extra activities for the whole day (7 hours) or half day (4 hours). Must be scheduled for days we are not open to the public or after/before regular hours. Prices start at $650 for half-day park rental and $1000 whole-day park rental. Add open pony carousel and/or hay rides for an additional fee. We have parking for 50+ vehicles. Call 318 929 PETS (7387) or Email for details. Jubilee Zoo is a good choice rain or shine. We have the moonwalks, the small animal petting zoo, and the pony rides all under cover. The hay ride is not much fun in the rain but there is still plenty to do in all weather. If you do elect to postpone your party due to a rainy forecast we will be glad to carry your deposit as a rain check for another available date and time. NO REFUNDS. Though Jubilee Zoo is not a "non-profit" organization, we operate on a very narrow budget without ANY income currently retained by the owners. We do most of the labor ourselves and provide the materials to build and maintain Jubilee Zoo - often augmented by our family's personal funds. We do this in an effort to offer a fantastic family fun facility for our visitors and offer a happy, healthy home to our animal friends. We do hope to grow to the point of recouping some of our investment someday, but for now, it is a labor of love. As we must plan to pad our feed budget to last through the winter months when business is slow, we do charge a premium for animal feed at the zoo. You may only feed our animals our feed - and yes, you will be charged for any extra feed or feed cones that you request beyond your party allotment. While we appreciate the suggestion that we would have more business if we had lower prices - it is just not feasible to charge less. Every person who walks through the gate or drives into the parking lot uses resources and enjoys the infrastructure in which we have invested. Adults pay to accompany children to the movies or on a city bus - please expect to pay for adults who accompany children to Jubilee Zoo. Even if it is just use of the bathrooms or hand sanitizer, there is a cost to Jubilee Zoo. We don't mind picking up and taking out the trash. We are pleased to offer a covered, cooled seating area and other amenities for you and your guests to enjoy as you sit and watch your children have fun! However, in order to have the funds to maintain said facility, we charge for EVERY guest aged 24 months and up - even grandparents who are just coming to watch the kids have fun. Though we do hope they will enjoy the hayride and other included activities as well. We offer a discount admission price to YOU as the individual(s) hosting the party. Consider it a coupon good for your use only. If you plan to have any of your guests pay for themselves, please plan to collect from them directly. If they pay us we must charge them full admission price even though they are with your party.